Over 60% of funds have quarterly or longer redemption frequency - which is to be expected. 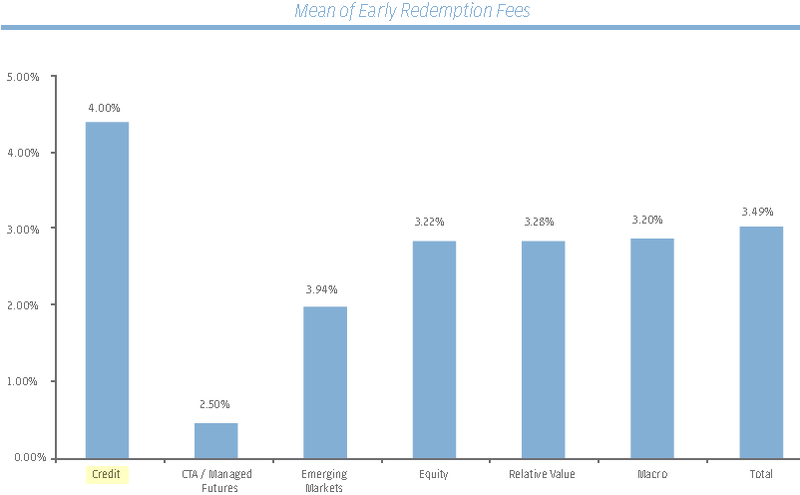 A large portion of the funds with longer periods between redemptions are credit funds, many of whom also restrict how much one can actually redeem per quarter (investor-level gate). This is important for these funds' survival because trigger-happy investors could quickly devastate them. Investors who "grew up" with listed equities often don't appreciate what it takes to liquidate credit assets such as bonds and CDS. And liquidity in these products is only getting worse, as the Volcker rule pushes dealers out of full market making (see discussion). This puts hedge funds at risk of having to unwind in markets where very few players stand behind their bid/ask quotes. Credit funds also require initial lockups (such as a year from initial investment) to make sure they build a diverse pool of investors. This way no one investor can force a devastating liquidation by pulling out. 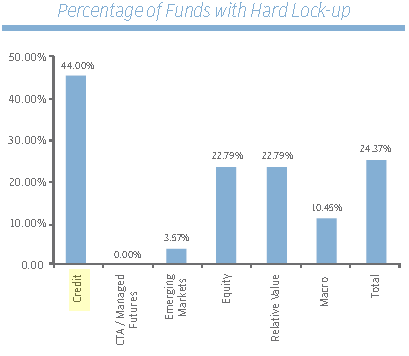 When it comes to "hard locks", lockup periods during which investors can not redeem under any circumstances, credit funds dominate. Recently a more investor-friendly approach has been to impose the so-called "soft lockups". Investors are allowed to withdraw early, but are required to pay a penalty in these situations. 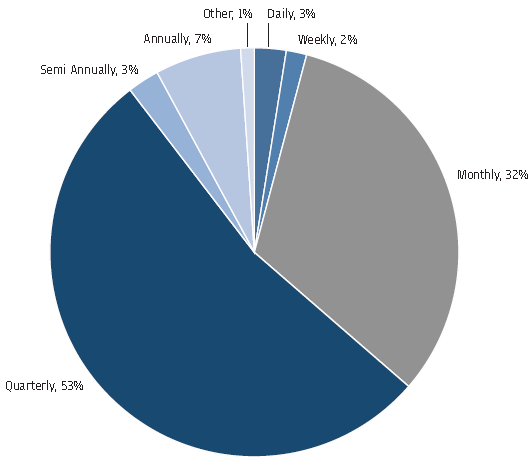 Not surprisingly, credit funds have the highest penalties for early withdrawal. As liquidity becomes more of a problem, the gap between terms for credit funds and other strategies (such as equities and futures) will only widen. Some funds will inevitably give in to investor demands for easier redemption terms (in order to raise more money). But these investors are asking for trouble. A large mismatch between the liquidity of assets (the portfolio) and of liabilities (investors' capital) will come back to haunt investors during volatile periods. That's when portfolios are dumped indiscriminately at ridiculous discounts just to meet redemptions, and investor losses are exacerbated.